With two national parks, hiking, off-roading and whitewater rafting, among an array of other active options, Moab, Utah, is one of the most sought-after destinations for outdoor enthusiasts. 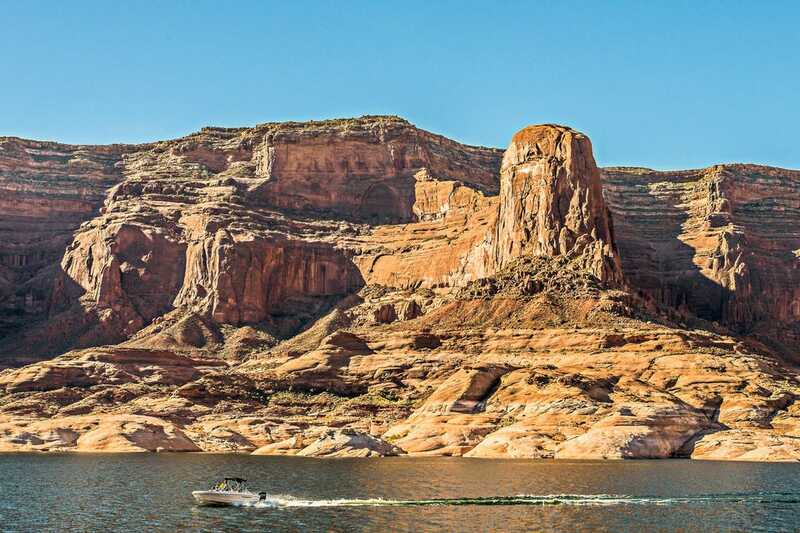 And the 186-mile-long Lake Powell is one of the world’s best spots for houseboating, water skiing and fishing. Both provide a paradise vacation for outdoorsy types, and both have something else in common: the Colorado River. For the mother of all outdoor adventures, plan a trip between Moab and Lake Powell. This is one of the few excursions that can be done by car or via water. Tour companies organize guided whitewater rafting trips along the 100-mile stretch of the Colorado River that ties the two regions together. These take travelers to the upper edge of Lake Powell, through remote wilderness and between dramatic sandstone canyons. For the road trip, we’ve got your back. 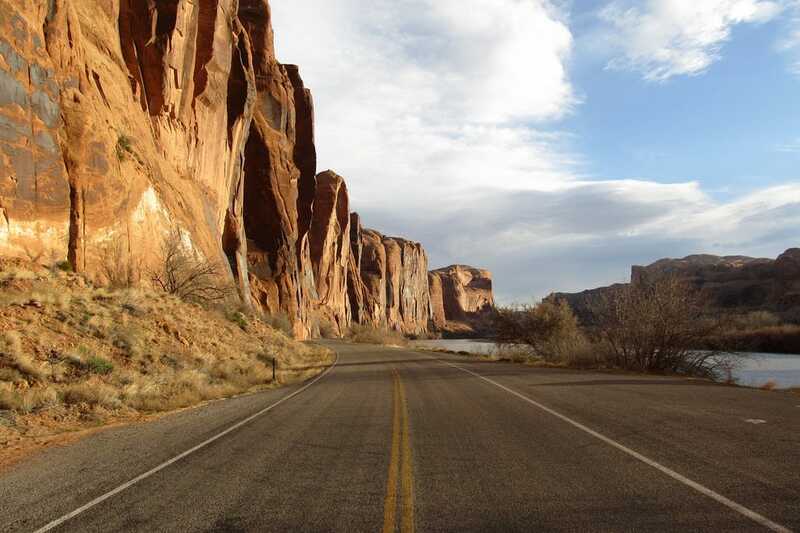 There are several different routes from Moab to Lake Powell, from the super short (South Moab to the northern Bullfrog Marina) to the long and winding, around to the west or south and slightly east. Each path has its own natural wonders, but we love the south shot on Highway 191. If you drive through, this trek will take around 4.5 hours. Or you can mosey through the tiny towns, rock formations and remote wilderness along the way and learn more about Utah and Arizona. 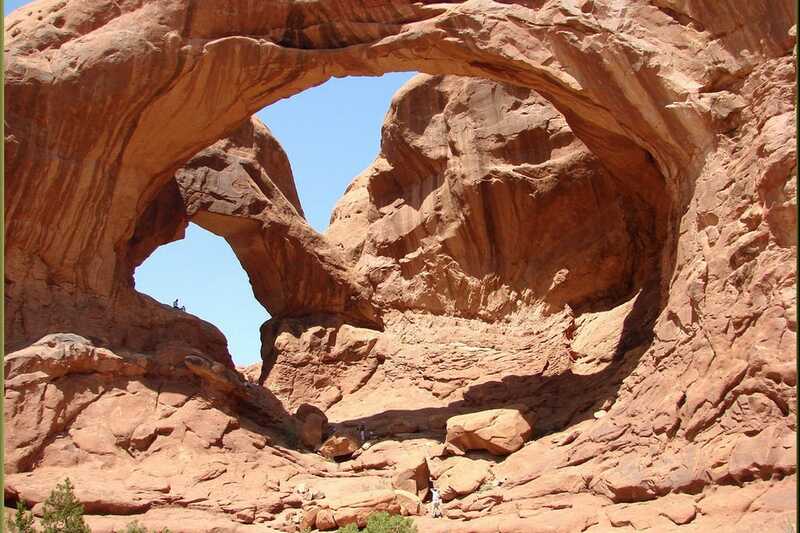 For that experience, here are 10 things between Moab and Lake Powell that you must see and do. 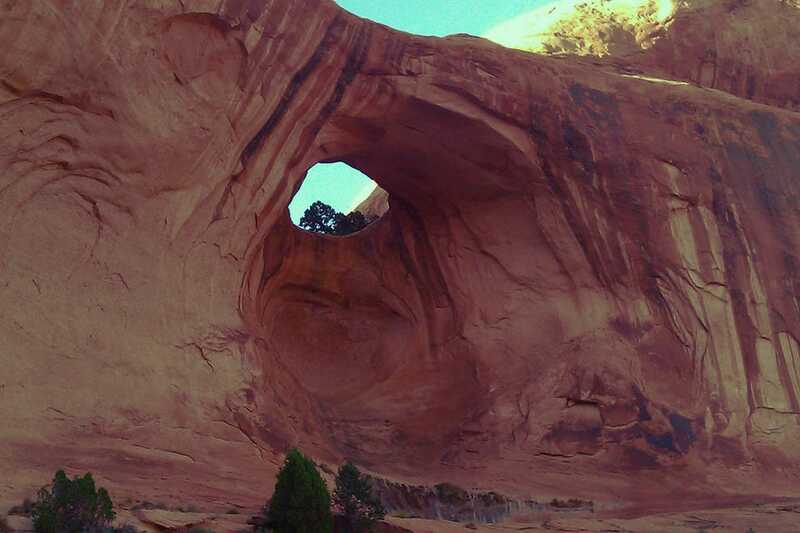 When you start in Moab, it can be hard to choose between all of the different adventures, but one not to miss is a hike to Corona and Bowtie Arches. The three-mile loop is family-friendly and worth the work, even in the heat. 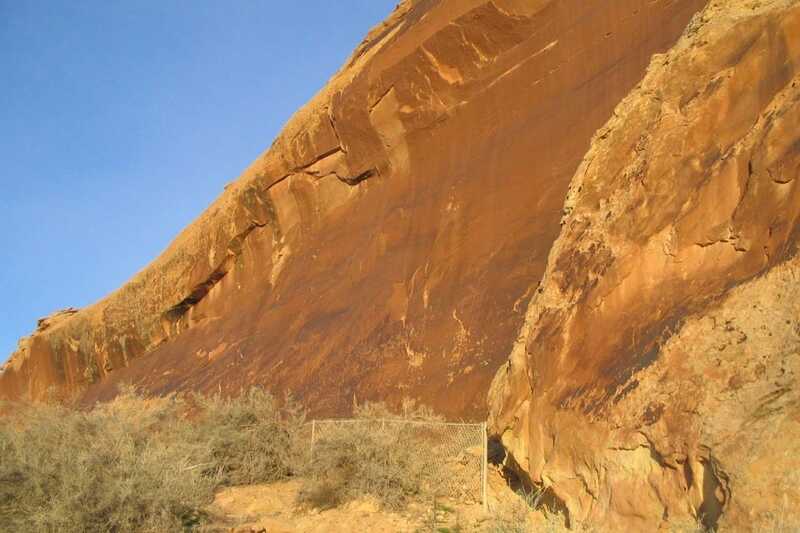 Climb up a ladder and rock steps and see the unusual natural rock Bowtie Arch. Continue farther to Corona, which you can walk right underneath. If your short arch hike has you itching for more rock formations, take a day trip (about five miles north on Highway 191) to the Arches National Park, the world’s largest concentration of rock arches. Delicate Arch Viewpoint is a great place to take pictures. Another exciting Moab day trip is Dead Horse Point State Park, with its stunning views of the Canyonlands National Park. After all that hiking, the short drive south to the Spanish Valley Vineyard and Winery will hit the spot. This small, family-owned farm winery is one of Moab’s favorites, and it’s a bit off the beaten path (in a good way). Tour the vineyard and winery and taste the wine, which may include a riesling, cab or even a cherry wine that tastes like a bite of pie. Continuing south, Monticello is a charming stop along the way. Learn about Western history in the museum, or even sign up for a tour to see a herd of buffalo. Visitors can also hit balls at the 18-hole Hideout Golf Course, which is rarely crowded. It’s a different way to experience Utah’s outdoors; this time, you won’t have to scrape red dust out from under your fingernails. Don’t visit Bluff for the bustling city; population is only about 320. This town is an excuse to stop and explore the nearby river, canyons, mesa tops, desert land, trails and Ancestral Puebloan ruins. Stop for the night in the Sand Island Camping Area, just off 191 on the north side of the San Juan River. Keep your eyes open for petroglyphs. Around here is where Highway 191 turns into 163. The Valley of the Gods is Utah backcountry at its finest. You won’t find trails or official campgrounds once you get inside; there’s just remote buttes and wide open spaces far away from civilization. This scenic patch of wilderness is located on Navajo Nation land, so you need a tribal permit to visit. Many travelers go out with a Navajo guide, which is a good idea for even experienced backpackers, due to the remoteness of the area. 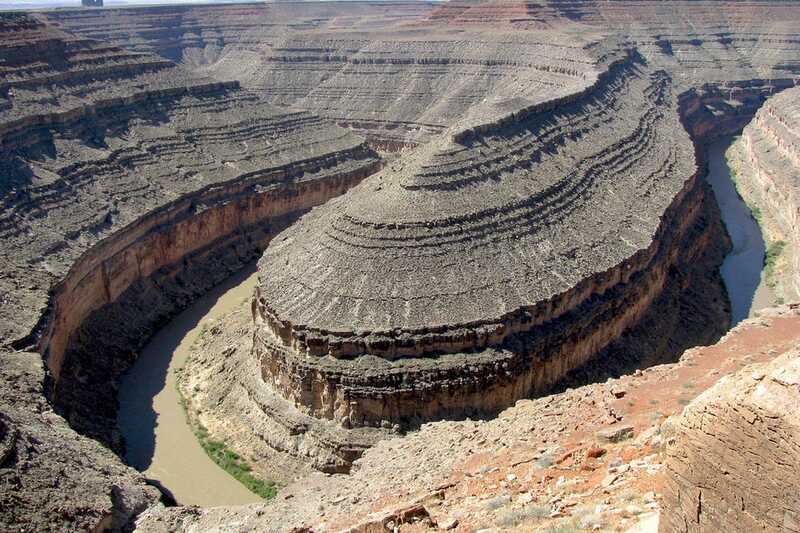 Goosenecks provides a glimpse at ancient history. This remote, natural park (no trails, no shade, no drinking water) is characterized by a fascinating and odd geologic formation called an “entrenched meander,” cut into the land over millions of years by a meandering river, and eroded by water, wind and other forces of time and nature. From the viewpoint, this deep canyon plunges about 1,000 feet down. In addition, look for the dark Alhambra Rock and in the distance, Monument Valley. Bring out your camera. You could say Monument Valley is the quintessential symbol of the American West. More Western movies have been filmed here than anywhere else in the nation. It’s characterized by its sandstone formations, rugged landscapes and the Four Corners Monument. Take a Jeep tour with a Navajo guide and learn about the history of Monument Valley (it is the home of the Navajo Indian Nation). 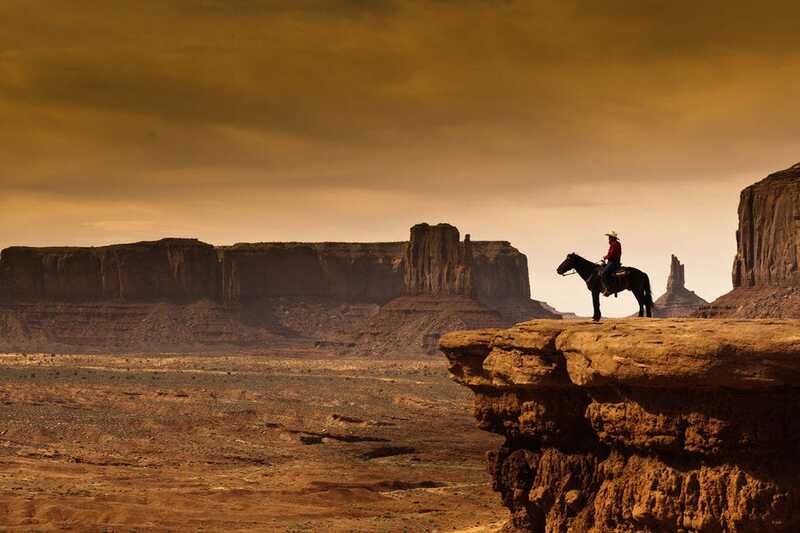 For the full Western experience, go horseback riding in Monument Valley. 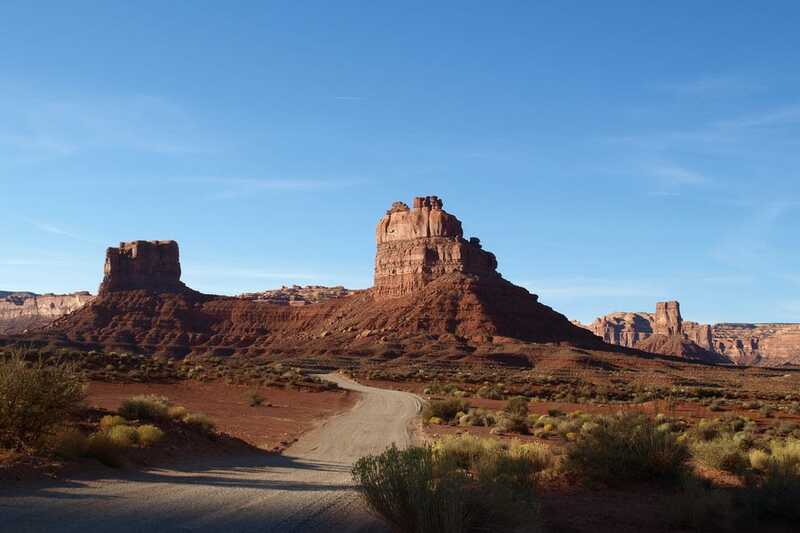 At Kayenta, the highway turns into 160, and just after that, you will come to Tsegi Canyon and Marsh Pass. Ancient Puebloans built sandstone villages around here between the years 1250 and 1300, and travelers can now take cliff dwelling tours of these preserved sites. Several trails also provide views of the dwellings. The Sandal Trail is paved and only a mile round-trip. You will arrive to the south side of Lake Powell, near the town of Page. Once you reach the lake, a must-do is a boat tour to the famous Rainbow Bridge National Monument, one of the world’s biggest natural rock bridges. Bring plenty of water and sunscreen, because there’s no shade on the trail and temps can top 100. Now that you’re on the lake, explore the various camping and fishing nooks and gaze in awe at the towering cliffs.